My name is Ryan and I recently purchased a number of engraved swords from your website as groomsmen gifts for my wedding. 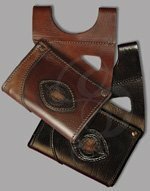 I normally don't write companies back unless there is a problem with the purchase, but I was so pleased with the quality, price and customer service that I made an exception in this case. The swords were of excellent quality and the engravings were exactly as I had envisioned them. The price for these swords was amazing, considering that they were hand-forged high-carbon steel. It was low enough that I was at first fearful that it may have been a scam, but when they arrived, it was clear that you guys are exactly as advertised. You guys really went the extra mile to ensure that I would be pleased with my purchase, and I can safely say that my choice of companies for future sword purchases will be a no-brainer. There's one part of your body that you *really* don't want getting hit in combat. And after you've armored that part as best you can, then it's time to find a helmet. Strongblade has a plethora of brain buckets for your perusal. Steel greathelms,larp fantasy helmets, weathered Spartan helms, kettlehelms. We even have a guy named Helmut we'll sell you! Have a look at our helmets page.You'll find a topper that's perfect for your mug and your budget. Above all Strongblade is a sword manufacturer and supplier. 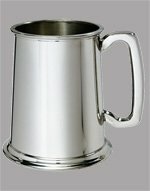 Swords and tankards that can be custom engraved. Swords, axes, spears, armor and more for Live Action Role Play. Tankards, goblets, mugs and steins. Helmets, chainmail, bracers and greaves. Unicorns, dragons, fairies and other fantasy gifts. Flintlock, blunderbuss and pistol replicas. Masks, elf ears, medieval clothing and other costumes. Pendants, bracelets, rings, lockets and more. 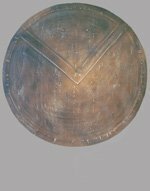 November 2018: At Strongblade we believe there is nothing better than an engraved blade except for maybe an engraved shield. 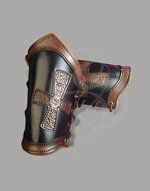 We have just added our steel bucklers to the list of products which we can engrave. These make great gifts or keepsakes. October 2018: We have been engraving military insginia and logos as custom requests for years but we have just added all of the U.S. Armed Forces Military instignia to our engraving artwork library. Now you can create a design featuring the logo of any of the Armed Forces branches with our online app. August 2018:Celebrate your ancestry with an engraved flag from the country of your ethnic background. We have just added over 100 flags from different countries around the world. Engrave a sword, dagger or tankard now with a symbol of your ethnic origin. June 2018: We have been working on this a while but we are proud to announce the addition of clip art images to our engaving web app. Now you can add art from our library of over 1,000 images. Create your artwork in steel. It's easy and fun. December 2017: Lots of new inventory of our most popular products have just arrived in time for the holiday season. November 2017: Love dragons? Get your Drag-on! 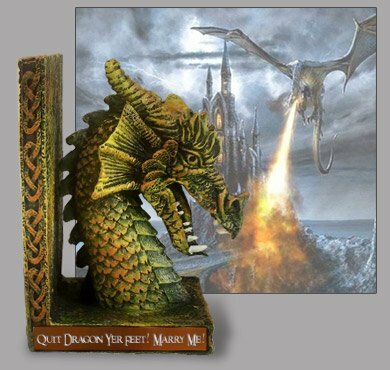 Check out our dragon bookends with custom engraved plate options. October 2017: Upgraded our website search engine with enhanced filtering to help you find the exact product you are looking for. Before there were swords, before even spears, there came the dagger. In fact, the dagger was quite possibly the first real weapon ever created by man. Oh sure, it may not have been called a dagger back then, more of a knife really, made from stone then chipped and scraped into a sharp point. It is believed that Thag the Smart Guy, a popular caveman from prehistoric times, first invented the dagger to kill a rival caveman named Grung. He is quoted as saying "Me tired of Grung hitting me with rocks. Me gonna fix him." However, since this whole incident took place before recorded history, that's all hearsay. The true dagger is a weapon that has both edges sharpened. The length and width of daggers varied quite a bit throughout history, especially early on, when the line between dagger and sword was notably blurred. Typical daggers tend to be no more than 14 inches or so in length, with European daggers usually having crossguards and pommels (and, knowing medieval Europeans, probably bloodstains as well). Swords supposedly owe their existence to daggers. In the arms-race of ancient history, daggers allegedly became longer and longer until they became in all respects, swords. When swords took over the dominant role in combat, daggers were still kept around for several reasons; they were great for close quarters fighting, they could be hidden easily and, if weighted properly, could be thrown at opponents. Daggers were also still quite popular in the dining halls to cut and skewer food as well (seriously). In the renaissance, daggers regained much of their popularity, but this time in a supporting role. Swords had become lighter and faster, allowing combatants to hold another weapon in their free hand. That weapon was usually a dagger and was used mostly to parry, bind or slow and opponents blade. Later, specialized daggers with large, basket-type hand guards were created to make the weapon even better suited to its new defensive role. 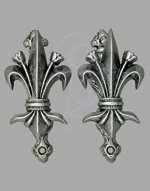 The new dagger was often referred to as "Main-Gauche," which in French means "My Gosh!" and was said to have originated from the first guy to die when his blade was parried by one such dagger. Alright, I'm a pathological liar. I need help. "Main-Gauche" actually means "Left Hand", which is a LOT less exciting than my definition, isn't it? Daggers have, throughout history also had more insidious roles as well. Their small size and ability to deliver quick lethal strokes made them excellent weapons for more unsavory types. Assassins relied on them because they were easy to hide. Julius Caesar, Caligula (and several other Roman Emperors), Poet Christopher Marlowe, St. Lucy, Scottish Regent Earl Douglas, and many many others in history have been assassinated by enemies wielding daggers. Another dark task given to daggers has been to dispatch of sacrificial offerings, whether the offering consisted of animals or humans. Many cultures throughout time have practiced ritual sacrifice and, usually, this was done using daggers (often ornate ones at that). Daggers eventually gave way to knives as time went on. Knives are generally single-edged weapons and are used for a large variety of utilitarian functions, only one of which is killing things. Knives have been carried by hunters, soldiers, craftsmen, repairmen and angry, crazy people everywhere (Strongblade obviously does not condone nor tolerate any kind of illegal activity with its weapons, nor will we sell our items to anyone we think will use them irresponsibly or in a "crazy" fashion).